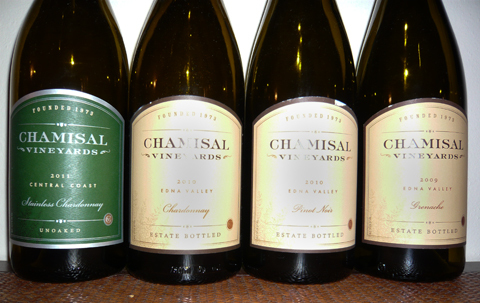 A flight of Chamisal wines: “A Taste of Summer” new releases. Online with the winemakers, TasteLive.com, May 24, 2012. 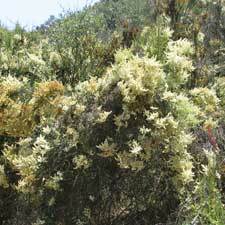 The soft, lovely name Chamisal, pronounced “Shah-mih-sahl,” comes from the ubiquitous shrub, chamise chapparal (chamisal), that grows prolifically and up to 12-feet tall in their area. The first vineyard planted in the Edna Valley appellation (between San Francisco and Los Angeles, and five miles from the Pacific Ocean), the 80-acre vineyard was founded in 1973 as Domaine Alfred, and in 2008 the Crimson Wine Group purchased it and rebranded it. The vineyard grows five varietals: Pinot Noir, Chardonnay, Syrah, Grenache, and Pinot Gris. Chamisal is known for big yet sophisticated Pinot Noirs; Winemaker Fin du Fresne quipped, “Our Pinots’ unofficial tag-line is, ‘My Pinot’s bigger than yours.’” Hmm! Within the five varietals, they grow an astonishing 25 clones which they happily blend together in varying ways with each vintage. Fin said, “As a winemaker it’s a lot of fun to play with that many types.” He and Mike Bruzus, Assistant Winemaker, frequently referred to the “spice rack” they have available to them. Although the four wines we tasted were completely different, still I sensed a voice, a similar thread, running through all of them. In response to questions as to why Fin would blend as many as 10 clones into one 100% Pinot Noir, for example, he said that instead of one clone’s unique characteristics dominating a wine, the terroir came through instead. The Chamisal Spice was referred to frequently and I experienced it as a woody spice (cinnamon, clove, nutmeg, even sandalwood) gently touching each wine. All of the wines we sampled were experienced primarily mid-palate in a nearly elliptical fashion. And yet, they achieved a wine that is astonishingly full-flavored and nearly full-bodied. Highly aromatic and intensely flavored with tropical fruit, the wine was slightly sweet with a brilliant citrus zing, minerals, great acidity and balance. Other tasters reported figs, tree fruit, pear, white flowers, peaches, pineapple, and green apple. 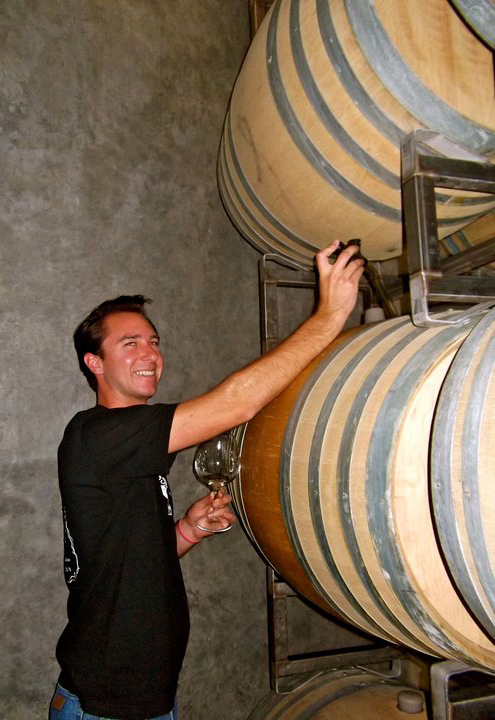 Mike commented on how wonderful it is to come to work and smell the beautiful aromas of Chardonnays in process. Fin agreed, and said that is precisely what he wants to capture in this wine in particular. It was fermented at 50-55° for more than a month—a very cold and very long fermentation—and this limits the yeast activity. Mike suggested pairing this with raw oysters, seafood, and Thai food; Fin doesn’t eat oysters (nor does he eat fruits or desserts) and he thought it would go well with white fish or sushi. In a funny moment, Mike (pictured at left) told us this is his favorite hiking wine. He puts it in the freezer, chills it to just short of freezing, and then enjoys it when he reaches the top of his chosen ridge. NOTE: Do drink this very cold. We experienced a metallic overtone as the wine warmed. Fin and Mike agreed that because of the screwcap closure, it will age well, but Fin said it wasn’t designed to improve with age, it simply would last well. Enjoy now and for the next two years. The grapes were sourced 16% at Chamisal and the rest throughout Central Coast, mostly Monterey County and San Luis Obispo. Three clones were used: 4, 75, 76. Next up was the Estate Chardonnay. This wine was made in the opposite fashion from the Stainless: fermentation in a combination of tanks and barrels, then full malolactic fermentation with aging on the lees for eight months, racked to a tank for a month for blending, then returned to barrel (40% French) for another five months. 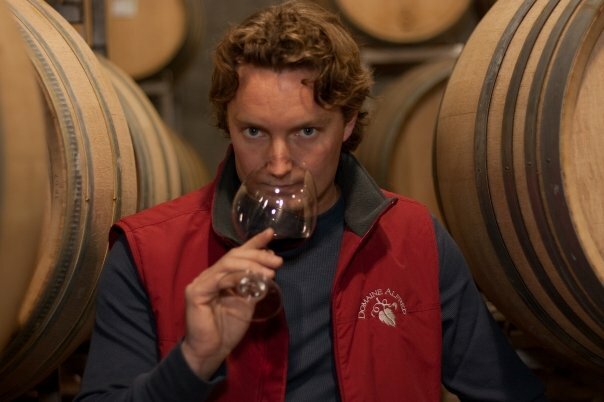 The winemakers are experimenting with Hungarian barrels—the oak is the same species as used in French barrels, and Mike said he prefers the nuances of Hungarian oak. The nose was a little warmer, with lychee and cantaloupe, floral and honeysuckle, pizza crust, and a thread of butterscotch as the wine opened. Just delicious—tropical fruit, a touch of oak; elliptical in mouth, with a long wood-spice finish. Other tasters reported candied kumquat, Meyer lemon zest, hint of ginger, hibiscus, sesame, toffee, allspice, Asian pear, figs. Fin would pair this with chicken on the grill with an Herbes de Provence rub; Mike would go for a crème brûlée. The grapes were 100% Estate grown with five clones used: 96, 352, 76, 5, Chamisal. I learned an interesting lesson from this one. The label and tech sheets say 14.5% alcohol, but the winemakers said the actual ABV is 14% or a little less—the labels and tech sheets were printed before the bottling was done. Gorgeous dark-ruby color. Vibrant and bright, yet heavy strawberries on the nose big-time and a whiff of cola. Spices, bright cherry pie, dark red fruits, black cherry, cinnamon, clove, a little white pepper, smoke, rich and bold but not overbearing—in other words, bright high notes balanced by dusky undertones. Other tasters reported new-car leather, nutmeg, graphite, sandalwood, earthy, floral, sour cherries, cigar box, cedar, cranberries, tar, a touch of raspberry-seed nuttiness, pomegranate, rose petals, lavender, toffee. This is an amazingly smooth Pinot Noir. That’s because there was no crushing done of these grapes. They wanted the fermentation to take place inside the grapes with pump-overs instead of crushing. Because of the light-handed extraction (they said “Burgundy in style”), this is a lighter Pinot in a way, yet smooth, voluptuous, and seamless, with supple tannins that will enable it to age well. It was aged 14 months in 41% new French oak, with each clone spending seven months by itself, and the wine as tasted here another seven months in oak after blending. The light-handed extraction was preceded by light-handed (“Burgundy-style” again) picking. In California, 24.5 Brix (sugar content in the grapes) is when many vineyards start to look at picking. In France, typically it’s 22.5-23.5 Brix. At Chamisal, they aim to pick Pinot grapes at 23. Fin (pictured at right), who hails from New Zealand, would pair this with New Zealand (not American, not Australian) lamb. Mike would pair it with pulled pork or steaks. Ten clones were used: Pommard, 114, 777, 667, 113, 115, 828, 943, 2A, and Archery Summit. The blending/bottling phases is fun, yet challenging—as Mike said, sometimes two clones can taste delicious individually and suggest blending with each other, yet they “don’t play nice,” so the blends take a while for them to figure out. Tough job, but someone’s gotta do it. Beautiful garnet color. Dust on the nose with big dark-red and black fruits. Cherry, pepper, pipe tobacco, spice, smoke, cola, brown sugar, herbs. Dense, concentrated. Tight structure (aged 22 months in 20% new French oak). This is a large, complex wine that the winemakers recommend laying down for five years. Their 2002 is “drinking beautifully now.” Other tasters’ impressions: shy, grippy, chocolate mint, thyme, herbs, mushrooms, soil, musty, dusty, spicy, cedar, brambly, berry, pepper, plum, vanilla, chocolate mint, thyme, cardamom, dusty flowers. Mike said growing Grenache is “not for the faint-hearted,” and Fin said the Grenache “keeps us honest” because it has to be severely pruned. While their Pinot Noir might bear 2-3 tons/acre, this prolific vine will grow 12 tons/acre if it can get away with it. Unfortunately, if allowed to grow as it wants, the clusters will not ripen; they must be thinned two to three times each season. In 2010, an extraordinarily cold year, their Grenache crop reached only 18 Brix, so that year’s yield became a rosé. Two clones were used: Noir, Alban. Both winemakers thought this was the most versatile food-pairing wine and agreed on pork. Benito (Benito’s Wine Reviews, wine-by-benito.blogspot.com) suggested lamb and rosemary-grilled potatoes and thought it would be a good Christmas wine with its plum and spice. Because of the cool climate, their grapes usually enjoy a long hang-time, which brings intense and concentrated flavors. 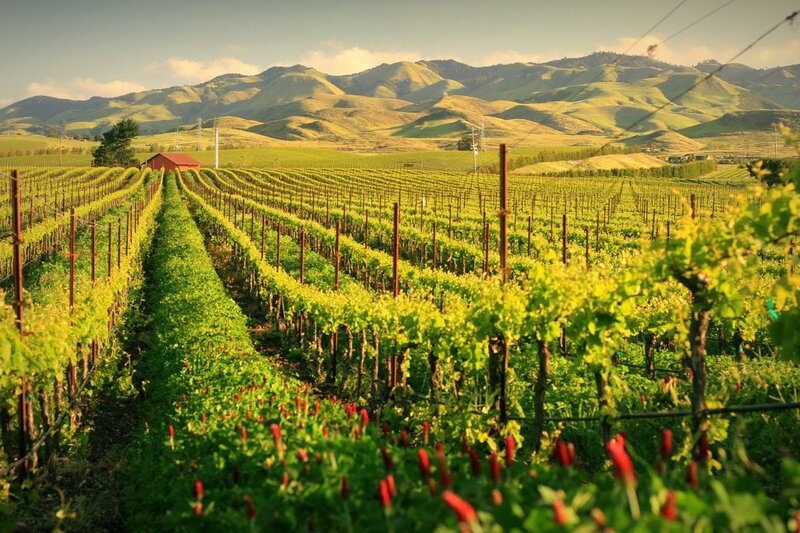 A bit of trivia: Paso Robles is 30 miles north of Chamisal, yet 30° warmer in the summertime! The difference is the cooling and fog/sunblock effect from the nearby Pacific Ocean. Mike said the Chamisal wines are like “a poor man’s John Albans blends.” Albans is their neighbor a mile away, and some of his clones are grown on Chamisal property. Chamisal is midway between Wolff and Talley. Chamisal is a certified sustainable vineyard. They had a lot of rain from 2009-2011, and 2010-11 were very cold seasons as well. They learned during the difficult years; regarding 2011, “Fasten your seatbelt!” Normally in their area, April through December brings no rain at all. Fin and Mike want to add one esoteric red varietal. They are looking at Gamaray, a Swiss cross between Gamay and Reischenstein, an inky colored wine—even the stocks of the vines are purple (Mike wants it). Domino (Germany) and St. Laurent (originally, but now rarely grown in France, now grown in the Czech Republic) are also under consideration. This year, Chamisal Vineyards will contribute to The Fender Music Foundation (FMF), a nonprofit organization dedicated to providing resources to music programs across the United States. From August to October 2012, a portion of the sales of Chamisal wines at retail and in fine restaurants will assist FMF in awarding grants to a variety of music programs for children and adults, including music-therapy programs, school-based programs, and independent after-school music training. Chamisal Vineyards’ donation will also help FMF award instruments and equipment to grant recipients, giving more individuals equal access to music education. This entry was posted in California, Chardonnay, Grenache/Garnacha, Pinot Noir, Tastings. Bookmark the permalink.